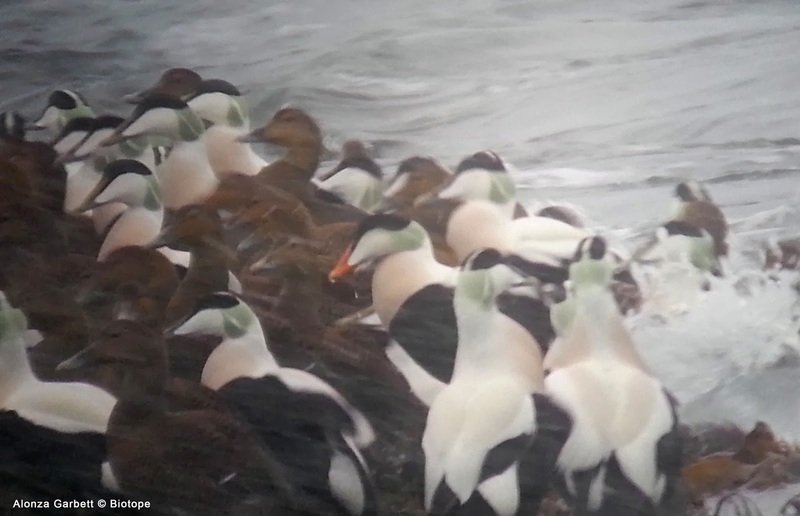 biotope: Varanger strikes again - Pacific Eider in Vardø! (!) 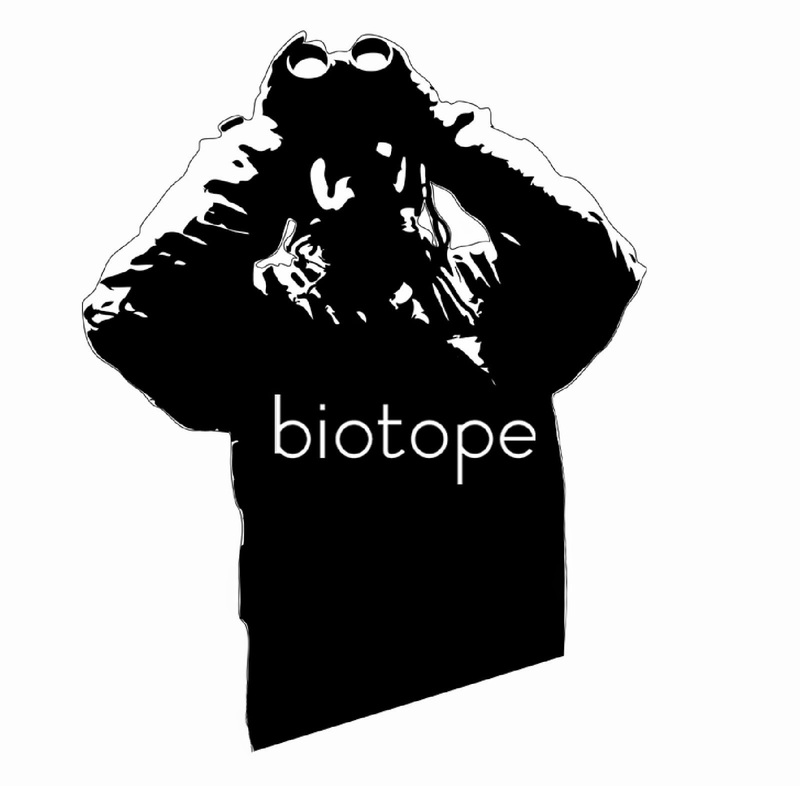 by Alonza Garbett - architect & birder at Biotope. Our office is of course equipped with a Swarovski spotting scope and with his Samsung phone Alonza managed a series of photos documenting this spectacular find. 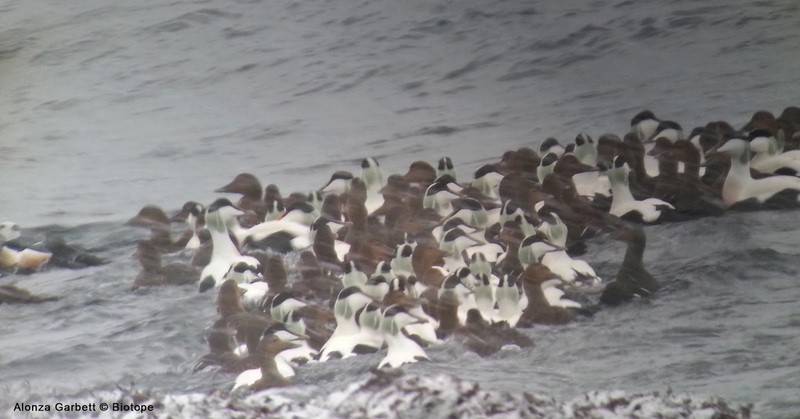 Conditions were less then ideal with heavy snow storm, but the photos are still solid documentation of the first ever Pacific Eider in Europe, or the Western Palearctic region (in birder terms). Digiscoped from the Biotope office by Alonza Garbett: Swarovski ATX 95mm + Samsung phone. Digiscoped In heavy snow storm. Unfortunately for me I spent the day in Vadsø on a business meeting (about bird projects, of course!). I saw the photo posted on twitter by Alonza on our way back to Vardø, and got a phone call from Alonza shortly after. Martin Garner had already, after seeing the tweeted photo, raised the question whether this could possibly be a v-nigrum eider. This resulted in some less than legal speed driving back to our office in Vardø. The bird however had drifted south accompanied by some 50 of its mollissima Common Eider friends. 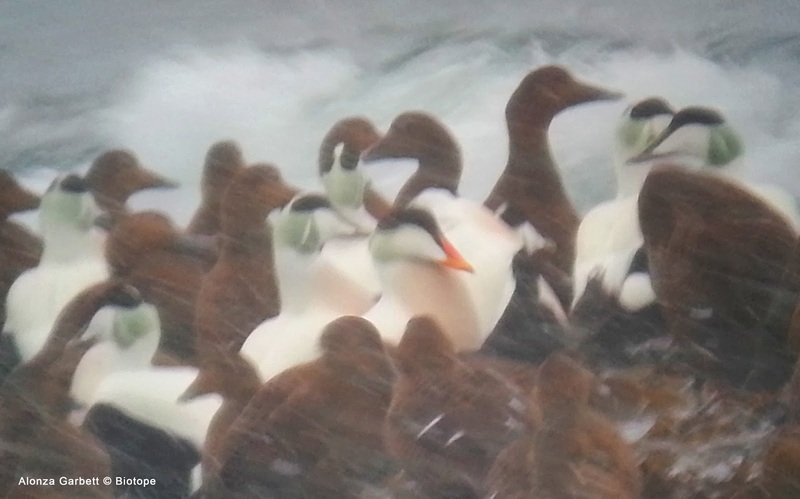 In scope view from the Biotope office we could find several rafts of King- and Common Eiders. Before the evening darkness made birding impossible we managed no more than registering approx 2500 Common Eiders and 750+ King Eiders in the waters south of Vardø, but did not connect with the possible v-nigrum eider. However the day after we got up at first birdable light, and was out birding at 07.30. One hour later I managed to find the same raft of eiders seen from the office the day before: some 60 Common Eiders, 8 Steller´s Eiders, 2 King Eiders and 1 amazingly cool looking Pacific Eider! Read more about the refind later in this post..
"The birds’ bill is strikingly bright orange tending towards redd-ish at the base of the bill. Immediately your eye is drawn to the deep arching curve of black on the lower edge of the black cap. On the Common Eiders the lower border is relatively straight. Adding further to the peculiar look of the head. the overall head/bill profile seems very long-looking and sloping, so the bill has unusual droopy look to it. Just visible caught in Alonza’s photos is the green coloration on the nape, and how it fades into the cheek sides and horizontally under the black cap. In both ssp borealis and ssp mollissima the green nape separates distinctively from the white cheek. According to Alonza he thought he saw the other big feature- a diagnostic black V under the chin. Due to less than ideal weather conditions (snow storm), unsurprisingly this was not confirmed a 100%." The Biotope office is the white house by the shore, just below the church. Our view of thousands of King and Common Eiders in winter and spring explains why we chose this place! Alonza Garbett demonstrating handheld phone-digiscoping from the Biotope office. To be honest it is almost unbelivable that a such a record bird for Europe / Western Palearctic was found from our office. 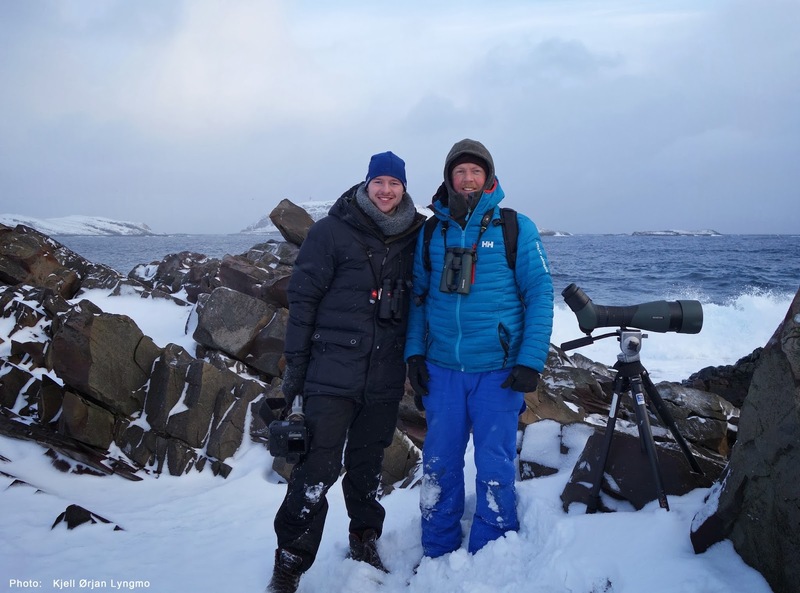 We are no more then a few birders in Varanger, so it may very well be worth following Alonza on twitter! Congrats to Alonza for finding it! Pacific Eider - phone-scoped by Alonza. You see? 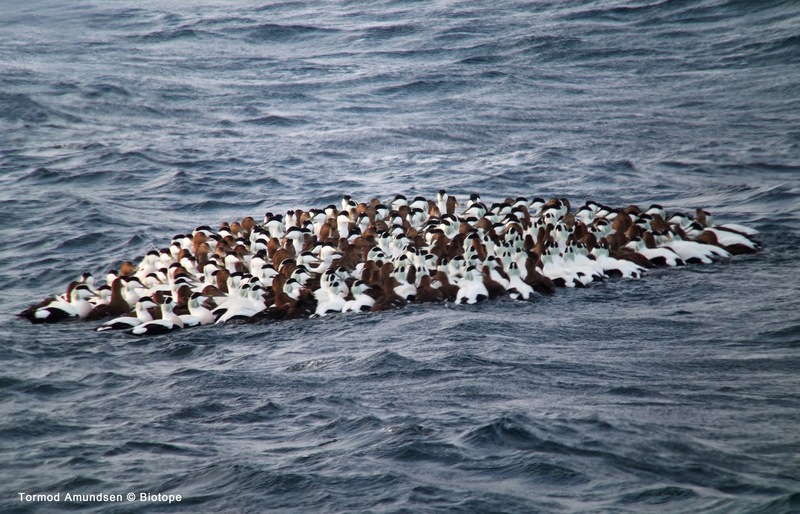 A typical winter / early spring view from out office: Tight eider rafts in arctic conditions. Like mentioned above I got up at first light the day after, hoping to refind the Pacific eider. After a few years in Varanger we pretty much know everything about how birds move around the waters of Vardø. After scanning the waters south of Vardø from our office, I could see a couple of small rafts of eiders, but too far away to pick out anything. There where also quite a lot of birds flying from east towards Bussesundet. 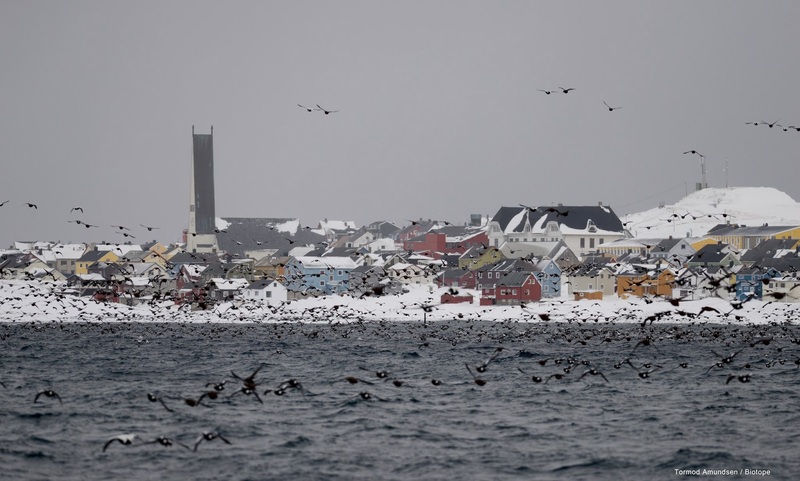 So the birding tactic of choice was to go to Steilnes and a height overlooking Østervågen (south harbour in Vardø). Soon after I found what must surely have been the eider raft from the day before, with the Pacific Eider standing out very well with its bright orange bill! It was distinctively different from the other eiders. However the eiders was very restless and within a few minutes after finding the raft they all took off and flew towards Bussesundet. This is where both King- and Common Eiders gather in large rafts as they dive for food in the shallow waters of Bussesundet. 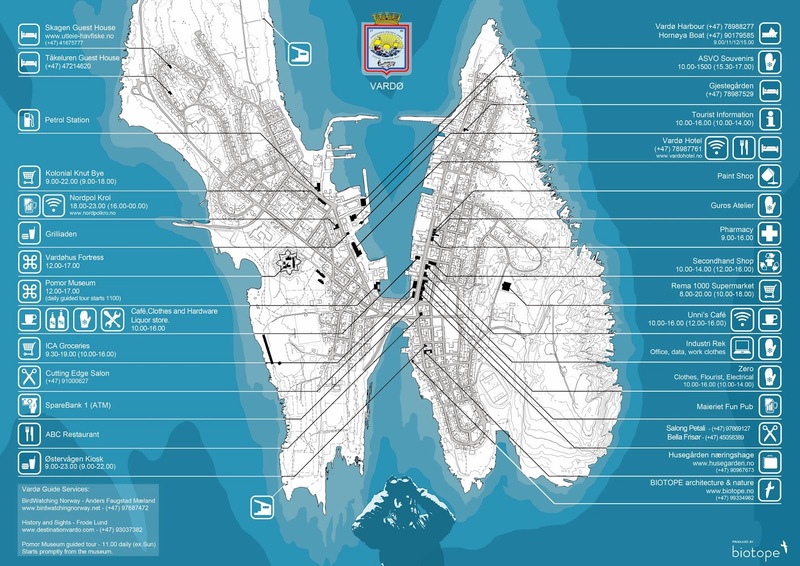 We recently made the below maps presenting Vardø town, for use for tourists and local businesses. 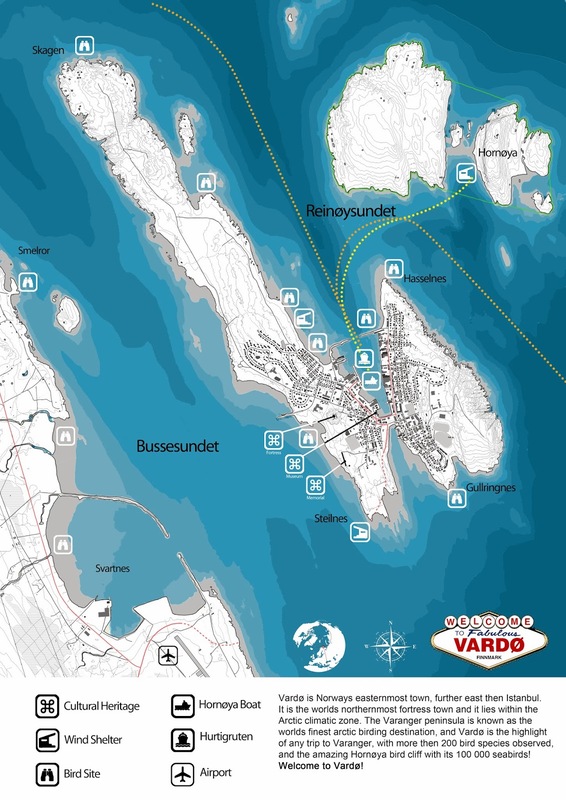 On the overview map of Vardø island you can see Bussesundet as the shallow body of water between Vardø island and the mainland. If eiders have a European capitol this is it! Last year we had 20 000+ eiders in this area! After the Pacific Eiders was lost in a swirl of eider as it flew to Bussesundet, I met Alonza and local birder and photographer Kjell ØRjan Lyngmo, and we continued our search for the Pacific Eider. The Steilnes bird hide was the next natural stopover for us: after all it is placed here to give shelter for birders when looking through huge rafts of eiders in winter time. The Steilnes bird hide / wind shelter - iphone panorama photo, with Bussesundet in the background. Soon after we arrived the bird hide we located three huge rafts of eiders in Bussesundet. Two of them where close enough to identiy individual birds, but the Pacific Eider was in none of these. The furthest away raft, of 600+ individual birds, was barely visible in the distance. 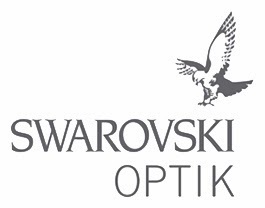 Our new Swarovski scope came to good use: as I set the scope zoom to 70x magnification I could just make out a bird with a brighter orangy bill! Nothing certain, as distance, waves, haze and wind made viewing conditions far from optimal. Just as it seemed the eiders was about to drift away out of sight to south Bussesundet, they turned and came towards us. Maybe we would get a glimpse of the bird one more time. All of a sudden the a few birds took off and started flying towards us, then another ten birds, then 20 more and within seconds the 600+ raft was airborne and heading directly towards us! This is one of those moments where the pulse of any birder accelerate. Within seconds eiders where passing us just in front of the bird hide in distances down to 50 meters. 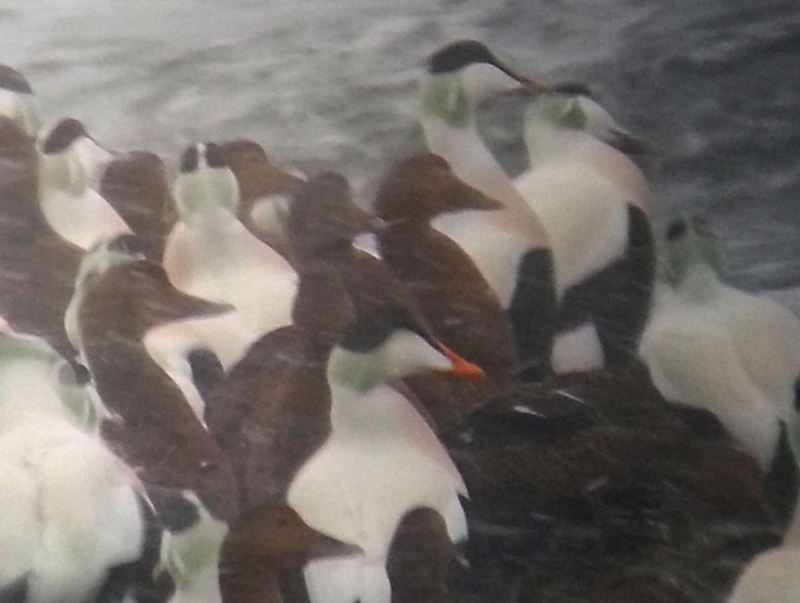 My binoculars was scanning the flock for a bright bright orange bill - and surely there it was! In the middle of the flock of flying eiders the Pacific Eider stood out with its strikingly coloured bill. As the bird came closer I got very good views of the head and where able to see the distinctive features on its head: particularly the green neck and how it faded into the white on its cheek. 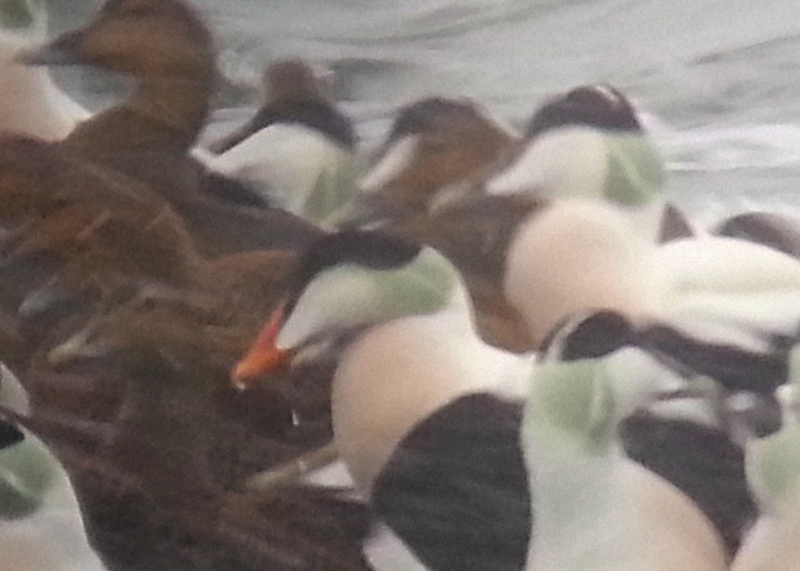 The green color also was slightly warmer toned then its fellow molissima-eiders. As the bird passed in eye level height, I only saw it in profile as it passed us, but without seeing a distinct black V on its throat, I did however see dark markings, as was also confirmed by Alonza, but again without great views of this ID-feature. The bird did still stand out quite a lot, particularily as its head shape seemed almost stretched in comparison to the other eiders.It all happened in seconds, but what a birding moment!! View over Bussesundet from Steilnes: from here we counted some 2000+ Common Eider and 700+ King Eiders. This is what a dense little rafts of Common Eiders look like. Digiscoped with Swarovski ATX 95mm + Sony RX100m2, yesterday, February 20th. Eiders in the surf: Digiscoped movie - straight from the SD card, no editing: Sony compact camera handheld to the Swarovski scope. 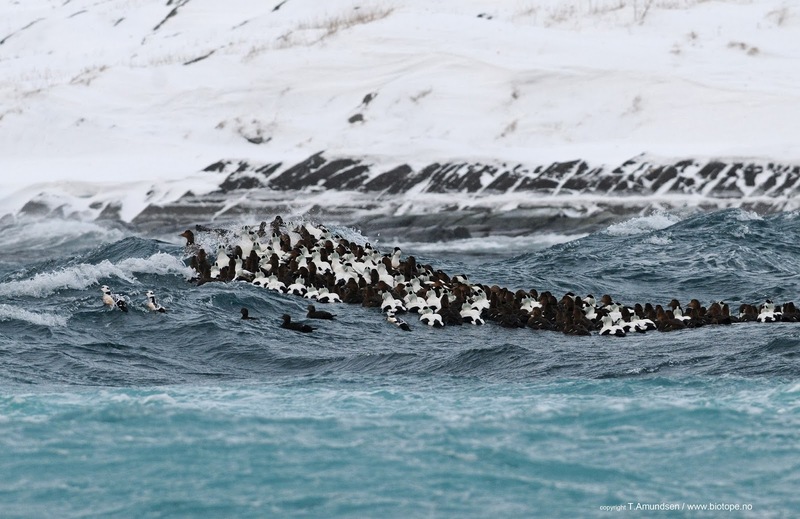 One more photo of the amazing Pacific Eider photographed by Alonza Garbett from the Biotope office. 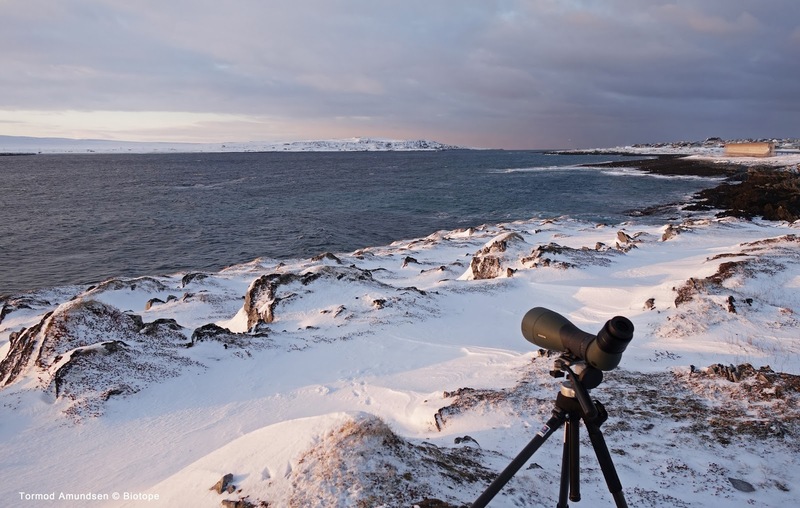 Stay tuned from more news from Varanger - the birding season have just started!